VPB has slipped quite a bit since the death of iconic brewer and beer judge Greg Noonan. Nowadays it's a fairly typical pub grub/experimental beer joint. The beer is nothing to get excited about, chipotle, espresso, banana stouts (damn, that actually sounds pretty good right now). They do have a decent lunch and good atmosphere, although it's kind of a tourist trap during the holidays. It is a must stop for any good craft beer historian visiting Vermont. This was once a great standard in Burlington, and still has it's place in the muddy pantheon of VT breweries. A number of breweries, including Lawson's and Smuttynose have recently put out Black IPAs in Greg Noonan's name. This place is must see but, kind of a disappointment these days. 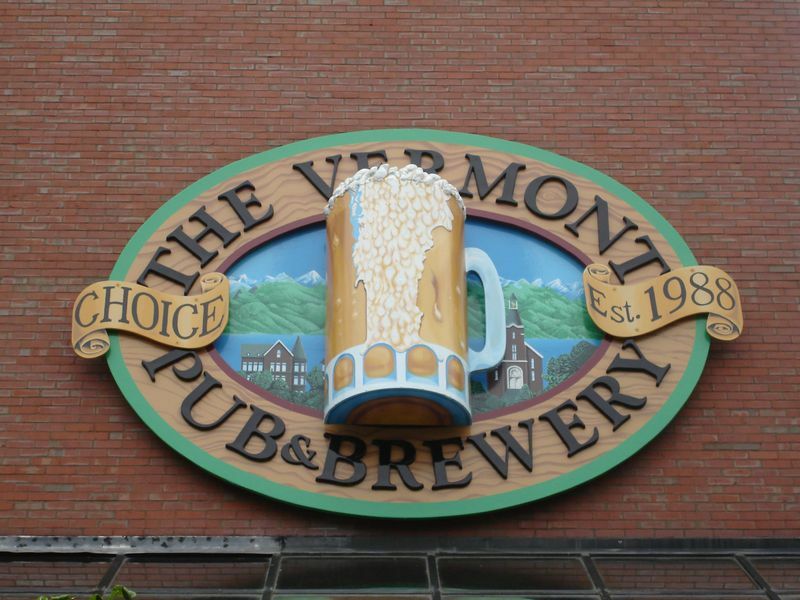 Vermont P&B has a good selection of beers, and is conveniently located in downtown Burlington, VT. There was a good selection of beers, and after trying the sampler I'd consider their overall beer selection good, but not quite great. I didn't try the food. Really, the best part of this stop was that you could sit outside on the patio drinking your beer right in downtown Burlington. I really loved their brewery's location. On a recent beer-themed vacation, this was one of the few places that I visited twice. The pub has a good variety of beer styles, including creative beers or styles not normally encountered in brewpubs. One of my favorite features here (and at other Burlington brewpubs) was that you could order a 1/2 pint for 1/2 the price of a full pint. This allows you to sample more beers without resorting to the 'beer sampler' which really isn't enough to enjoy. I ate dinner their twice and was pleased each time. The food was very reasonably priced and often made with local and/or organic ingredients. After reading other reviews, I wondered if I missed something. I went here around 10pm on a Thursday night. They had a late night food menu which was nice. Place was still hopping with people. All tho it does seem family friend it has two sides to the bar so it was nice also for adults. As stated online and on there sign they are the oldest brewpub in Burlington and VT I believe. It sort of shows its age, to me a little dated. I had just something off the late night menu as indicated they had and the food was good... I finished up and walked back to my hotel. If I was back in Burlington, I would try it again to make sure I was not missing something. One of my many stops for the Vermont Brewery Challenge. Right in downtown Burlington. They offer a great selection of beer including seasonal and cask ales and lagers. Located a block away from 2 other breweries this one was my favorite. I visited here on a busy night. Service was great. The bartenders were eager to pour me my next glass. I even took some growlers home. We sat down and ate some food in the restaurant. The food was good and at a good price. VP&B is an excellent brewpub. It has a wide variety of ales, with a couple lagers, and continually changes its beer menu. It always has at least one seasonal beer on tap and a cask. There is plenty of patio seating as well as a fair number of tables inside and a sizable bar. The atmosphere is nice and casual, suitable for Burlington, Vermont. It's also family friendly, though still contains an adult atmosphere with some late night weekend music on weekends. Staff is very friendly. Not only are the beers delicious, but they are set at a very reasonable price, with an option to get an 8oz, 12oz, or pint-sized (for most) glass. If ever in Vermont a definite place to check out.